Stabilized HeNe Lasers - Intrinsic and extrinsic locking techniques, performance, design, implementation, testing. Vintage Lasers and Accessories Brochures and Manuals - Manufacturers' literature for a variety of classic equipment. Sam's Classified Page - Assorted laser, optics, and electronics stuff for sale or trade, and items wanted. Searching for Good Home for Some of My Lasers or Laser Related Equipment and Parts! While I am flattered when other people are interested in what I've developed, everything in Sam's Laser FAQ is copyrighted material. This includes, but may not be limited to: all text, photos, diagrams, and schematics, as well as the look and feel. Obfuscation of the material by removing or adding to it, changing colors, etc., does not make it acceptable! The laser community is rather small so violations will very likely be uncovered. If you're using Sam's Laser FAQ material on a public Web site, in an eBay auction, or even in a research paper that's available on-line, I will find it. As noted in the section above, non-commercial use of this material is permitted as long as the source is acknowledged in an appropriate manner. So, why take a chance at ending up in this hall of shame for the World to see! :) However, for-profit use is strictly prohibited under any conditions without prior approval. White Laser Pointer - It can be done describes how to build an RGB laser pointer from salvaged parts. (Which IS nice!) The first photo of the underside of a Blu-ray optical pickup is pixel-for-pixel copied from the Dissection of Blu-ray Reader Assembly. Even the filename is the same. I was unable to contact the owner of the rog8811.com Web site. Open Optogenetics DPSS Lasers includes a diagram of an older green laser pointer lifted from the chapters on DPSS lasers. KES-400A (PS3 Developer Wiki) uses some photos from Dissection of a Blu-ray Reader Assembly. There doesn't appear to be a way to contact anyone on that site directly. I have attempted to send email to the operators of all these Web sites. The email either bounced or there has been no response or there was no obvious way to contact them at all. Anyone in these lists who respond and comply will have all references to their transgressions expunged from this document here and on any other Web sites where I have access. Special thanks to Don Klipstein (Email: don@donklipstein.com) for his comments and additions to this document in the early stages of its development. His Web site (http://www.donklipstein.com/) is a valuable resource for information relating to lighting and related technology in general. Special thanks to Steve Roberts for much of the material in the chapters on Argon/Krypton Ion Lasers including direct contributions of text and photos, as well as via extensive email discussions. He has also developed an interest in high power CO2 lasers and is knowledgeable in many aspects of laser technology so his contributions can now be found in many other chapters as well. Special thanks to Iain Rauch of LaserPointersUK for the contribution of the remains of a very dead (and still dead) green laser pointer for analysis. Special thanks to Cascade Laser Corp. for the contribution of an HP and Zygo HeNe laser. Extra special thanks to Phil Bergeron at the University of South Florida for both stimulating discussions and helping and encouraging me to obtain, test, and document numerous interesting lasers over the last few years. And finally, much appreciated thanks to Aerotech, Inc., who no doubt didn't realize it at the time and almost certainly still has no idea. But but various HeNe lasers and power supplies from their dumpster(s) in the mid-1990s (probably when they discontinued their HeNe laser operations) provided much of the initial material for the Laser FAQ, especially in the chapter on HeNe lasers! :-) In fact, the Laser FAQ would probably not exist had several cartons of HeNe laser items not been dumped on my doorstep around 1997. I currently own a variety of lasers including numerous HeNe laser tubes, heads, and complete lasers (including other colors than red) from very small to fairly large, and commercial and home-built power supplies; and several air-cooled argon ion laser heads, my home-built power supply, and a still-in-need-of-reassembly Omni-150. I have countless laser diodes and a few complete modules, pulsed Nd:YAG heads with a home-built power supply, a high power CW Nd:YAG head in need of a new arc lamp (and a small miracle which will probably never happen), several DPSS green lasers (both commercial and home-built), and external mirror HeNe lasers using tubes with one and two Brewster windows mounted in home-built resonators (including a nifty one-Brewster tube that does green!). My oldest commercial laser is a Spectra-Physics model 130B HeNe laser built like a tank which has a manual dated 1966 (though I don't know if my actual sample is quite that old. Best of all, after a bit of tender loving care, it actually still lases. I do not know of any other working 130B lasers with an original tube in the explored Universe. The next oldest is an American Optical 3100 HeNe laser - also the only known working sample of this laser still in existence. I power up both these lasers daily at least for a few seconds to show I still care about them. This appears to be the attention they desire and performance continues to be unchanged, even after several years for the 130B. (As of 2010, the SP-130B still lases, barely. The AO-3100 lights up but does not lase, possibly due to degradation of the soft-coated mirrors, which are unprotected. The discharge color looks normal.) However, I've since acquired several samples of the Spectra-Physics 119 stabilized HeNe laser, which are of similar vintage. Two of these still work fine, with output power easily exceeding the original specifications. I don't have this original laser (it's probably locked away in a museum somewhere) so I had to settle for a 3-D hologram of the laser head as shown in Hologram of Theodore H. Maiman's First Ruby Laser. (Laser hologram in a box courtesy of Gary Cullen.) The holographic image is actually a bit nicer in person. And by changing your viewing angle (with respect to the hologram, sorry, this won't work on a computer screen - yet! ), the ends of the laser head and reflections in mirrors surrounding can be seen. 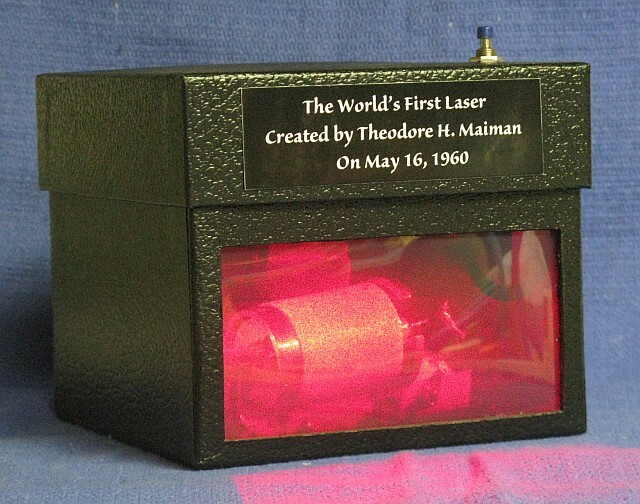 That's still a bit better than the Photo of Components of Theodore H. Maiman's First Ruby Laser (Photo courtesy of Bob Arkin). Laser Stars - LASER HISTORY (1917-1996) for an interesting chronology of laser development, discovery, and applications. The Laser: A Light Fantastic - WDTV LIVE 42 (1967). AT&&T Archives: Lasers Unlimited (1969). Unfortunately, as of Summer, 2001, links to these courses from the CORD homepage have been removed supposedly due to the expiration of their funding. While the courses are/were available for purchase in print form, It's a pity that this has happened. Print is not the same as on-line, even if it were free. MEOS GmbH was a developer of laser educational materials and equipment (among other things) but now appears to be gone for good. They had the lab/study manuals for their courses on a wide variety of laser related topics. While designed to be used in conjunction with the laboratory apparatus which they sell, these manuals include a great deal of useful information and procedures that can be applied in general. Note that EXP05, EXP07, and EXP08 link to the same file, as do EXP13 and EXP15. EXP11 and EXP30 through EXP34 do not have any accompanying files as yet (and probably never). Most are also archived at the Wayback Machine Web Site If anyone has the missing or damaged files, please contact me via the Sci.Electronics.Repair FAQ Email Links Page. As of Summer 2012, MEOS has stopped development and support of these kits. (In fact, the company doesn't seem to exist anymore, at least not doing anything remotely related to photonics.) However the creator of the experiments and author of the manuals has been acquired by LD Didactic (Leybold) and is continuing this line, which is represented by Klinger in US. The updated manuals are now available for free download at the Leybold Ld Didactic Web Site. PHYWE, a German company provides educational materials for laboaratory experiments, some similar to those from MEOS, above. Of relevance are HeNe, CO2, and Nd:YAG lasers, interferometers, Kerr and Faraday effect, and much more. Google inadvertently comes up with their complete course notes on the Nikhef Web site at PHYWE Courses but they don't appear to be accessible on the PHYWE Web site, so they may disappear without notice. PI Micos, another German company also has educational laser products. Go to PI Micos Educational Laser Systems. 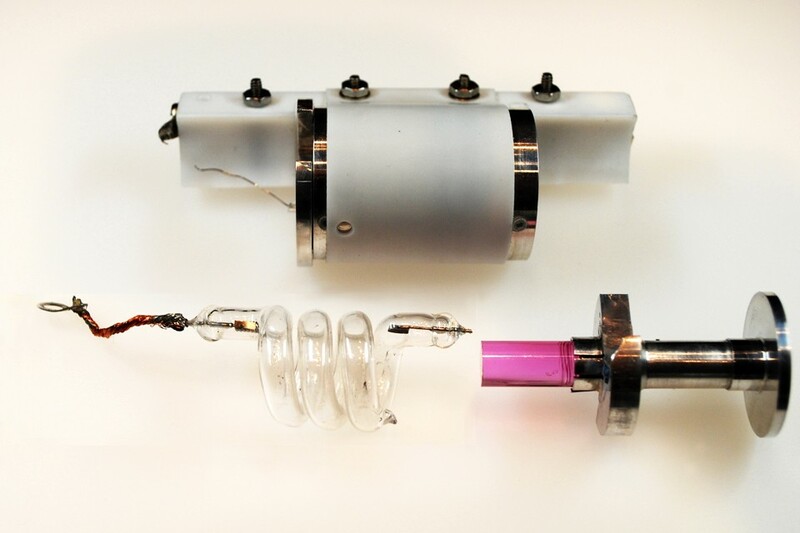 Instruments for the Advanced Physics Laboratory has a few experiments involving lasers and optical effects. DIDA CONCEPT is a French company with similar educational products. Go to "Practical Works" for experiements.